You want to quench your thirst and you’re trying to decide between the fruit punch and the orange juice. The fruit punch appears to have a mix of so many different fruit flavors that you would think it would be made with a variety of fruits. WRONG! It can all be so confusing which is why I’m here to give you some helpful tips and help you make the healthiest choice! When you’re making your selection, make sure that the label reads “juice.” You want the contents of the carton to be 100% fruit juice. Avoid any products with the labels “fruit drink,” “cocktail,” “beverage,” or “punch. These products may contain minimal amounts of juice and loads of added sugars. Although their nutrition labels state they contain vitamin C, they are missing other nutrients such as B-vitamins and potassium. To determine the nutrient contents, check the nutrition facts label. The first thing that you should check on the label is the serving size. You’ll notice that the serving size is usually one cup (250 ml). Don’t let this entice you to drink more than a 1/2 cup. According to Canada’s Food Guide, one serving is equal to half a cup of juice. Juices are higher in calories and lower in fiber therefore I recommend limiting your intake to no more than 1/2 cup per day. Consider diluting your half cup serving with water to increase the volume and still have the great taste you’re craving. 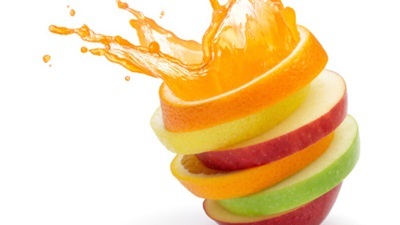 Choose the actual fruit more often than juice to reap the maximum nutritional benefits. Following the nutrition facts table, you will find the ingredients list. As the saying goes, “less is more.” In this case, the less ingredients, the more nutritious. Too many ingredients means too many additives and too much processing. Remember, water and milk are great healthy alternatives. Water is free, easily accessible, and you can add some berries, a lemon, or a lime for a refreshing taste. Although this advice is for making healthy choices regarding your juice selection, there has been much media attention focusing on juice diets, also known as a juice cleanse, a juice detox or juicing. A juice cleanse focuses on living off of minimum amounts of energy gained from the juice while you go through a detoxification process, which can remove many toxins from your body and promote a healthier gut and improved immunity. However, there has been no scientific evidence supporting any of these claims. And if you ask me, your liver and kidneys do a pretty good job at filtering and eliminating waste and toxins. People who try a juice cleanse or juice detox report having increased energy and feeling better overall. Much of this benefit is likely attributed to the decreased consumption of high fatty foods and processed foods containing an abundance of added sugars. Committing to a juice cleanse should be done with caution. By eliminating essential nutrients such as protein and fat, you’re putting yourself at risk for nutrient deficiencies. Protein also helps slow down the rate at which the sugars from the fruits and vegetables are absorbed. Because of the lack of protein, the sugars are quickly absorbed leaving you with a quick surge of energy followed by a quick downfall, leaving you fatigued. Fat is necessary for absorbing many vitamins. With the lack of fat in this juice detox, your body won’t be able to absorb many of the vitamins and minerals that are abundantly found in fruits and vegetables. The biggest concern is combining a juice cleanse with a colon cleanse. Generally, colon cleanses are advised for medical procedures such as a colonoscopy. Participating in colon cleanses or colon irrigation can cause bloating, cramping, nausea, and vomiting and may lead to dehydration and in severe cases bowel perforations and infection. If you choose to participate in a juice cleanse, consult with your doctor, especially if you are taking any medications or have any health conditions. This may have severe health ramifications, especially if you have diabetes due to the high sugar loads from the fruit and the difficulty in counting and managing the carbohydrate loads. Be aware of any herbal ingredients used and check to see if there are any side effects or interactions with any medicine you are taking before embarking on a juice cleanse. If you are having a colon cleanse then ensure that all equipment used is disposable and new. Make sure to stay well hydrated. If you choose to participate in a juice detox, keep it short (no more than a week). Don’t feel discouraged if a juice cleanse or juice detox doesn’t work for you and it only lasts a couple of days. The best kind of diet for losing weight and living a healthy life is one rich in vegetables and fruit, a variety of whole grains, low fat dairy products, and lean sources of protein. “Gastrointestinal System – Bowel Cleansing: Key Practice Points,”Practice-based Evidence in Nutrition [PEN] November 2009; http://www.pennutrition.com, last accessed September 4, 2013. Access only by subscription. Dombrow, C., “Supermarket confusion: Juicy advice,” Canada.com website 2013; http://o.canada.com/2013/08/21/supermarket-confusion-juicy-advice/, last accessed September 4, 2013. Picco, M.F., “Is colon cleansing a good way to eliminate toxins from your body?” Mayo Clinic website 2013; http://www.mayoclinic.com/health/colon-cleansing/AN00065, last accessed September 4, 2013. Zeratsky, K., “Do detox diets offer any health benefits?” Mayo Clinic website 2013; http://www.mayoclinic.com/health/detox-diets/AN01334, last accessed September 4, 2013.